We invite the media houses to this press conference for the launch of the second edition of Run for Nature in 2018, organized by the Association for the Conservation of Bugoma Forest on 25th March, in the recurrence of the International Day of Forests which is on 21st March. 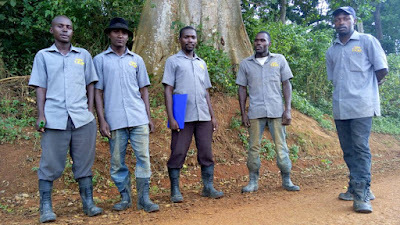 The Association for the Conservation of Bugoma Forest (ACBF) is an environmental membership association, not for profit, registered in 2016 in Uganda (Hoima District), with the main aim of helping the protection and conservation of Bugoma Central Forest Reserve and surrounding areas in Hoima District. The Association is built on the experience of the Bugoma Forest Conservation Campaign which was launched in 2014 and among other activities we organized the first edition of Run for Nature in September 2014, when about 220 people run. The proceed of the Run was invested in a tree planting project of 3 acres inside Bugoma Forest reserve in partnership with National Forestry Authority. The Association meets every year at the Annual General Meeting where members elect the governing body or Executive Board. The current chair person of the Executive Board is Mr. Costantino Tessarin. The association relies on donations, sponsors of good will for meeting the costs of the activities and for this reason we have a fund raising campaign called “The chimpanzee go!” whereby handicraft items and t-shirts are sold at different selling point (particularly in the properties of Uganda Jungle Lodges) and the proceeds go to the Association. We also have an Italian cell based in Bologna which operates as a point of sensitization and collection of donations. This year the second edition of Run for Nature has the objective of providing funds for the current main activities of the Association. We believe in the “magic of doing” and not in the “magic of talking”: as others talk but don’t do, us we are doing concrete things and we do it with very limited resources. 1) Management of the public nursery bed. Open in July 2016, located in Nyakafunjo (Kimbuga Parish), Kabwoya Sub-County (Hoima District), it provides free indigenous tree species to the community around Bugoma forest where need is great. About 20 families have benefited for more than 7.000 trees in exchange with our monitoring, training on good practices, attention to protection of water strings and agroforestry. The nursery is also serving as the basis for the prospective tree – planting projects in the area. The nursery is employing 3 people. 2) Chimp T-RAP Private Patrol. This is a private patrol project started in March 2017 on the occasion of the celebrations of last year International Day of Forests which was done in Mwera eco-tourist site in Bugoma Forest. A team of 5 people is enrolled under the Association to support the protection of the forest in collaboration with the staff of National Forestry Authority, which leads to proper observation in the forest and gain intelligence of the encroachers and any illegality. This project is very crucial, due to lack of sufficient patrolling staff from the government. 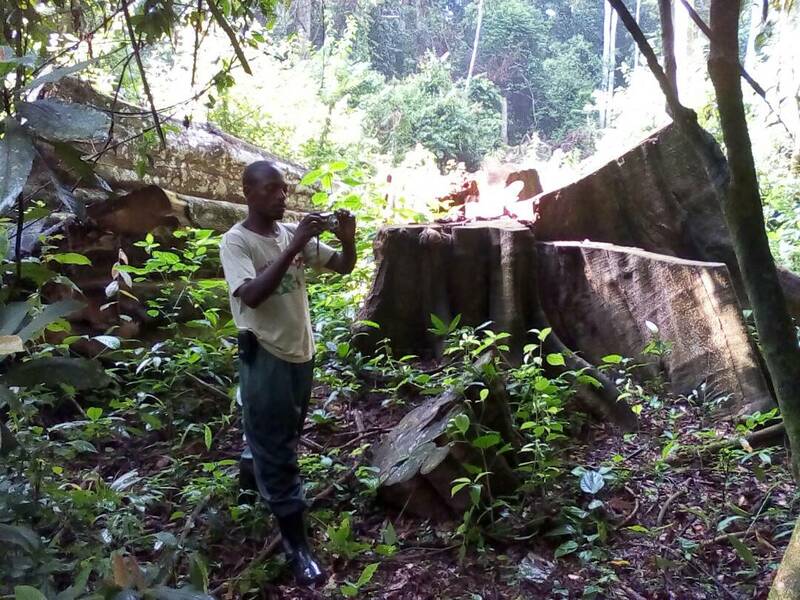 The patrol made steps in tackling part of the recurrent illegal logging in Bugoma Forest. Some resources were also allocated for legal support for the cases open at Hoima Police Station, some concerning attacks (on 21th July 2017 and 3rd November 2017) and threatening violence against our team. 3) Sensitization programme in schools. The Association is planning to start a sensitization programme with 3 primary schools in the area (Kisaru Primary School, Kaseeta Primary School, and Nsoozi Primary School), schools located in the communities around Bugoma Central Forest Reserve. The programme has the objective to prepare activities with children to explain forest biodiversity, conservation and ecotourism. Many of these children are from families of illegal loggers or labourers of illegal loggers. Bugoma forest in Hoima District, with 411 sq km of extension, located alongside the escarpment of Lake Albert basin, was rated 12 out of 65 forests surveyed in Uganda for biodiversity importance by Uganda Forest Department in 2002. From a scientific survey carried out in 2010, it is estimated that in Bugoma Forest there are many animals, birds species and plants to be protected and that it is also important because is one of the last remaining forests along the wildlife migratory corridor of the Lake Albert region, between the Murchison Falls Conservation Area (in the North) and the Semliki reserve (in the South). Bugoma counts a record of 267 species of trees, 18 mammals, 278 butterflies, 221 birds species. Among the mammals, the primates are abundant, with about 580 endemic and endangered chimpanzees, the endemic Ugandan mangabey, a large number of black and white colobus, red tailed monkeys, blue monkeys. The Ugandan mangabey only remains present in Bugoma, as it disappeared from other forests in the region. Among other animals, Bugoma hosts a small population of bush elephants, golden cats, side-striped jackals. Bugoma forest is a huge potential tourist destination along the Rift Valley circuit, yet a forgotten treasure of Uganda. Only the development of an organized “Ugandan mangabey trekking” could bring consistent revenues from tourism to the Government of Uganda. However, there are many and systemic obstacles in the protection of Bugoma Forest. First of all, the natural boundary of the protected reserve let the forest be exposed to all sort of pressure in an area which is becoming highly populated and recurrently invaded by refugees and migrants. Indeed common crimes in the forest are occurring like: encroachment for farming or for charcoal burning; encroachment for cattle rearing with bush fire clearing; illegal logging of hard wood is huge threat. Another set of obstacles is the political bias against the protection of the forest, by both local politicians backing encroachers and by the Bunyoro Kingdom establishment, who even attempted to clear the protected reserve back in 2016 and a court case is still open in Masindi against the National Forestry Authority. It is common to hear local politicians saying that the “forest is overgrowing in people’s land” and that “Police should stop arresting loggers”. The body mandated to protect the forest, National Forestry Authority, is not sufficiently staffed and organized for this hard task, leaving the forest often unprotected, which requires more concerted efforts. Finally, in the Police of Hoima we noticed resistance in taking seriously or following up properly cases related to illegal logging and environmental crimes. For example, a huge crime like a mob attack to a forest patrol occurred on 3rd November 2017 with a policeman almost killed (Mr. Eric Mbaia) and the case up to date is not been followed up. Another threat to the survival of Bugoma Forest is the prospective development of critical oil roads exactly inside and through the forest, while the oil refinery is planned to be built just on the North of the reserve. Therefore the intervention and partnership with civil society and private organizations is and will be vital for the protection of the forest. The situation on the ground confirms the necessity to keep our project of the private patrol in cooperation with National Forestry Authority and the necessity to work more on the ground involving local communities in an organized manner. Run for Nature 2018 is the second edition of what we believe is the major environmental sport event taking place in Kampala, having the objective to sensitize over the forestry crisis in the world and to fund raise specifically for the project of the Association. The event will take place on SUNDAY 25th March 2018 at 7.00 am and the venue is Plot 2B, Robert Mugabe Road Kinawataka – Mbuya Hill , Kampala (office of Destination Jungle Limited and head office of the Association for the Conservation of Bugoma Forest). The day was chosen in concomitance with the International Day of Forest on 21st March. The theme of this year Run is “Stop abusing the planet”: we will run for nature, believing that all of us, as individuals and as a society, should be entirely taking up the responsibility of the impact of our life style for the survival of our planet, which is suffering our abuses when we clear forests, we pollute air, water and the soil, we happily waste garbage and we invade all the environment, even those habitats which we should leave for other species to enjoy. Participants in the Run can register for 5 kilometers and 10 kilometers run with prizes in different categories (women, men and corporate). The amount of the prizes is 1.600.000 UGX. Registration fee is 40.000 UGX for individuals and 250.000 UGX for corporate which allows 4 people to participate. Registration points will be at the office of Destination Jungle, at Association of Uganda Tour Operators (AUTO), at National Forestry Authority and at the Café Pap. In the run package participants will receive the official green t-shirt, thanks also to the support of Asiatic Sports. The target of Run for Nature is to raise a contribution of 10.000.000 UGX for the projects of the Association. This will be possible thanks to the mobilisation of partners, sponsors and Medias in the organization and in the registration. We are targeting participation by about 300 people. During the run and after partners of Run for Nature will have the chance to display their reasons. The National Forestry Authority will run to advocate for more political attention and more resources for the forestry sector. Slow Food Uganda invites people to have a special healthy lunch, after the run, at Mulongo Catering Restaurant in Nsambya organized by the Slow Food Chefs Alliance Uganda with a fee of 25.000 UGX. Green Bio Energy (Briketti) will display alternative eco-friendly charcoal and it is amazing that after so many years of this friendly alternative the government and the public did not embrace the cause of alternative charcoal, but insists in extracting charcoal from forests like Bugoma. The Association of Uganda Tour Operators will bring its members in the run and will run remembering that the protection of the forests and the environment is also in line with the promotion of eco-tourism as a key income resource for the country. The Ngamba Island Chimpanzee Trust will also be present to bring the cause for survival of the endangered chimpanzees of Bugoma forest and Uganda as a whole. The Uganda Scouts Association will run with the youth who are the future of Uganda, a young generation which is well educated to the civil responsibility and committed to “leave the world a bit better than the way it was found” (as the founder Sir Baden Powell said in his last speech to the scouts of the world). The scouts will also help in the logistic of the run. A special thank to the Embassy of Italy and to the Ambassador H.E. Domenico Fornara for supporting the Run for Nature with the patronage of the Embassy of Italy. We are honoured that our environmental caused is embraced by the diplomatic representation of Italy in Uganda. We would like to thank all the sponsors who made possible Run for Nature 2018. We thank them particularly because not many are committed in supporting environmental causes like our and this is encouraging. We thank Cassia Lodge, Cafe Pap, Highland Water, Asiatic Sports, Destination Jungle, Uganda Jungle Lodges, Tarpo Industries and Aerolink Uganda.